This week’s recipe comes from Sarah our Head Chef. 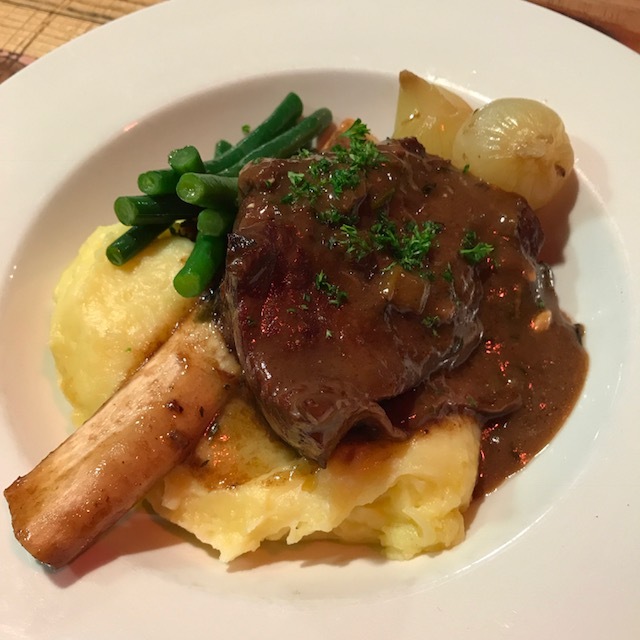 For our bistro on Wednesday night for one of the dishes she slowly cooked beef short ribs taking the idea and flavours of Steak Diane and turning it into something meltingly tender. The beef falling off the bone in a brandy mushroom sauce. If you don’t feel like cooking this we’ve also packaged a few ready to heat and eat at home. Heat the oven to 180°C. Brown the meat side of the short ribs in a little oil in a flameproof lidded oven dish. Set the ribs aside and add a bit more oil to the dish if necessary. Add the chopped vegetables and cook till soft without browning too much. Put the ribs back in the dish amongst the vegetables. Mix in the flour and cook for a minute. Warm the brandy a little and pour over it into the dish. Bring it to the boil and ignite the brandy to burn off the alcohol (take care you don’t stand too close!!). Finally add enough beef stock to cover the ribs and season. Cover the surface with a piece of baking paper and then put on the lid. Place in the oven. After 20 minutes turn the oven down to 160°C. Cook for at least 2½-3 hours. Check from time to time and add more stock if necessary. Once its ready, taste and adjust the seasoning and gently stir in as much or as little sour cream as you like. Serve with mashed potato or wide pasta and a green vegetable.